In Michigan in 2012, there's really only one issue on the radar: jobs. How does the state get more of them? How do residents fill them? How much do they pay? In the hours leading up to Gov. 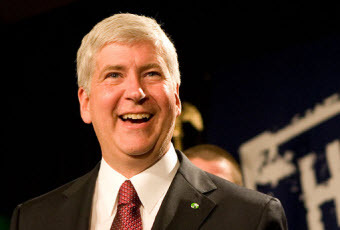 Rick Snyder's second State of the State Address, some notable numbers came in: Michigan's unemployment rate in December 2011 was 9.3 percent, nearly 2 percentage points below where it was in January 2011 -- the time of Snyder's first SOS. Snyder mentioned the jobs figures in his speech Wednesday night several times. How did Snyder's comments fit with the numbers and what the experts say are the drivers behind them? Click here to see a Michigan Truth Squad special analysis of Snyder's treatment of the jobs issue Wednesday night.